While contraceptives do help with family planning, what really helps is preventing women from marrying very young.A survey in Pakistan revealed that women under 19 years of age at marriage were much more likely to give birth to five or more children than those who were at least 19 years old at marriage. The same survey also revealed that visit by family planning staff did not have a significant impact on reducing fertility rates. Instead, women who watched family planning commercials on TV were much less likely to have very large families. Being the sixth most populous nation in the world, Pakistanis are also exposed to disease, violence, and natural disasters, which increase the odds of losing children to accidents or disease. At the same time, many consider the use of contraceptives to be un-Islamic. In addition, the preference for a male offspring is also widespread. As a result, Pakistani parents are inclined to have several children. 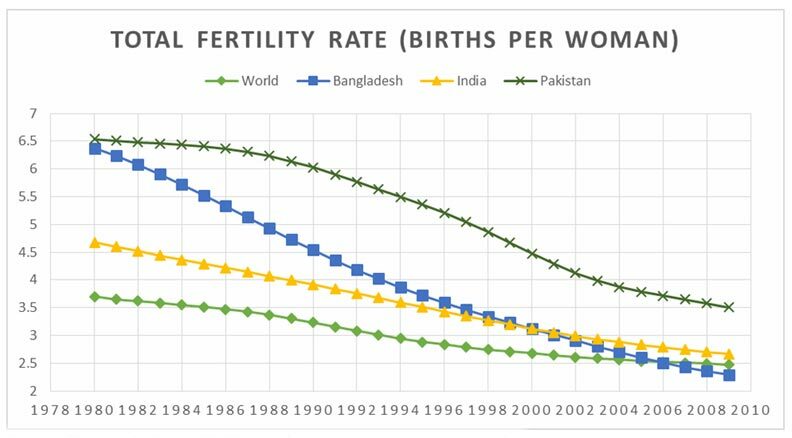 The immediate task for the governments in Pakistan is to ensure that the rate of decline in fertility rates observed over the past two decades continues. At the same time, the governments in Pakistan should learn from Bangladesh that has made significant progress in stemming the population tide. Source: The World Bank (2013) – Graph generated by Murtaza Haider. Getting down to two children per family may seem an elusive target, however, Pakistanis have made huge dents in the alarmingly high fertility rates, despite the widespread opposition to family planning. Since 1988, the fertility rate in Pakistan has declined from 6.2 births per woman to 3.5 in 2009. In a country where the religious and other conservatives oppose all forms of family planning, a decline of 44 per cent in fertility rate is nothing short of a miracle. A recent paper explores the impact of family planning programs in Pakistan. The paper uses data from the 2006-07 Pakistan Demographic and Health Survey, which interviewed 10, 023 ever-married women between the ages of 15 and 49 years. The survey revealed that only 30 per cent women used contraceptives in Pakistan. Though the paper in its current draft has several shortcomings, yet it still offers several insights into what contributes to high fertility and what the effective strategies are to check high fertility rates in Pakistan. The survey revealed that the use of contraceptives did not have any significant impact for women who had given birth to six or more children. While 24 per cent women who were not using any contraceptives reported six or more births, 37 per cent of those who used contraceptives reported six or more births. At the same time, 27 per cent of women who were not visited by the family planning staff reported six or more births compared with 22 per cent of women who had a visit with the family planning staff. Meanwhile, demographic and socio-economic factors reported strong correlation with the fertility outcomes. Women who were at least 19 years old at marriage were much less likely to have four or more births than those who were younger at the time of marriage. Similarly, those who gave birth before they turned 19 were much more likely to have four or more births. Education also reported strong correlation with fertility outcomes. Consider that 58 per cent of illiterate women reported four or more births compared to 21 per cent of those who were highly educated. Similarly, 60 per cent of the women married to illiterate men reported four or more births compared to 39 per cent of the women married to highly educated men. The survey revealed that literacy among women mattered more for reducing fertility rates than literacy among their husbands. The underlying variable that defines literacy and the prevalence of contraceptives in Pakistan is the economic status of the households. The survey revealed that 32 per cent of women from poor households reported six or more births compared to 21 per cent of those who were from affluent households. The above results suggest that family planning efforts in Pakistan are likely to succeed if the focus is on educating young women. Educated young women are likely to get married later and will have fewer children. This is also supported by a comprehensive study by the World Bank in which Andaleeb Alam and others observed that cash transfer programs in Punjab to support female education resulted in a nine percentage point increase in female enrollment. At the same time, the authors found that those girls who participated in the program delayed their marriage and had fewer births by the time they turned 19. 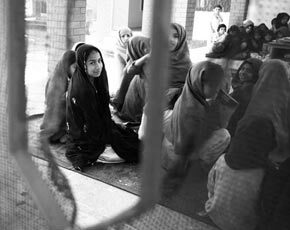 The religious fundamentalists in Pakistan will continue to oppose family planning programs. They cannot, however, oppose the education of young women. The results presented here suggest that high fertility rates could be checked effectively by improving young women’s access to education. At the same time, educated mothers are the best resource for raising an educated nation.